Explore the latest data and disparities for each indicator. Download the latest MICH-1.3 and MICH-9.1 data in spreadsheet format [31 KB]. From 2006 to 2015, the infant mortality rate decreased by 11.9%, from 6.7 to 5.9 deaths under 1 year of age per 1,000 live births, exceeding the Healthy People 2020 target. In 2015, several groups in selected demographic categories had the lowest rate of infant deaths, including infants born to Asian or Pacific Islander mothers, infants born to mothers aged 30–34 years, and infants weighing 2,500 grams or more at birth. Between 2007 and 2016, the percent of live births that were delivered preterm (less than 37 completed weeks of gestation) decreased by 5.8%, from 10.4% of live births to 9.8%. Healthy People 2020 objective MICH-1.3 tracks the rate of deaths that occur within the first year of life per 1,000 live births (infant mortality rate). HP2020 Baseline: 6.7 infant deaths per 1,000 live births in 2006. 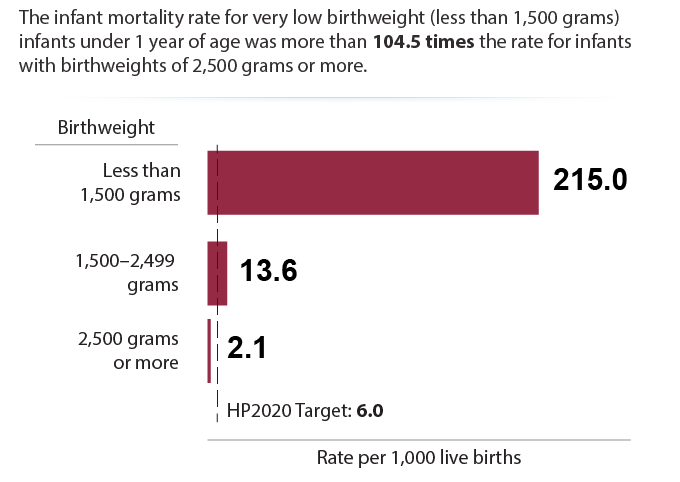 HP2020 Target: 6.0 infant deaths per 1,000 live births, a 10% improvement over the baseline. The infant mortality rate decreased by 11.9% between 2006 and 2015, from 6.7 to 5.9 infant deaths per 1,000 live births, exceeding the HP2020 target. Females had a lower infant mortality rate than males (5.4 versus 6.4 deaths per 1,000 live births in 2015). The rate for males was 18.6% higher than that for females. Infants of married mothers experienced a lower mortality rate than infants of unmarried mothers (4.5 versus 8.0 deaths per 1,000 live births in 2015). The rate for infants of unmarried mothers was 78.7% higher than that for infants of married mothers. In 2015, the mortality rate was 215.0 per 1,000 live births for very low birthweight (less than 1,500 grams) infants, compared to 13.6 for infants with a birthweight of 1,500–2,499 grams, and 2.1 for infants weighing 2,500 grams or more at birth. The rate for very low birthweight infants was more than 104.5 times the rate for infants with birthweights of 2,500 grams or more. The rate for infants with a birthweight of 1,500–2,499 grams was more than 6.5 times the rate for infants with a birthweight of 2,500 grams or more. Unrounded values with additional decimal places beyond what are shown here are used in calculating health disparities, including identifying the best group and calculating the differences between groups. Rounded values displayed here are used in calculating changes over time and percent change needed to meet the target. All comparisons described are statistically significant at the 0.05 level of significance. Data for this objective are available annually and come from the Linked Birth/Infant Death Data Set, CDC/NCHS. The terms “Hispanic or Latino” and “Hispanic” are used interchangeably in this report. Healthy People 2020 objective MICH-9.1 tracks the percent of infants born preterm (before 37 completed weeks of gestation). HP2020 Baseline: 10.4% of live births were preterm in 2007. 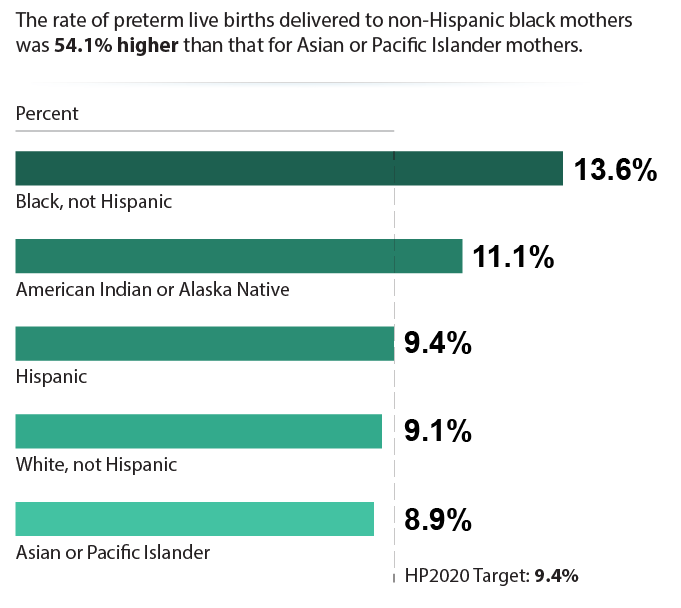 HP2020 Target: 9.4% of live births, a 10% improvement over the baseline. Between 2007 and 2016, the total preterm birth rate decreased 5.8%, from 10.4% to 9.8% of live births. A smaller proportion of females were born preterm than males (9.4% versus 10.2% in 2016). The rate for males was 8.5% higher than that for females. The percent of live births to married mothers that were preterm was lower than that for unmarried mothers (8.9% versus 11.2% in 2016). The rate for unmarried mothers was 25.6% higher than that for married mothers. *Unrounded values with additional decimal places beyond what are shown here are used in calculating health disparities, including identifying the best group and calculating the differences between groups. Rounded values displayed here are used in calculating changes over time and percent change needed to meet the target. Data for this objective are available annually and come from the National Vital Statistics System-Natality (NVSS-N), CDC/NCHS. The baseline and target for this objective have been revised. Gestational age data used in the calculations for this objective are based on a new standard for estimating the gestational age of the newborn. Details are presented in the report: Martin JA, Osterman MJ, Kirmeyer SE, Gregory EC. Measuring gestational age in vital statistics data: transitioning to the obstetric estimate. Natl Vital Stat Rep. 2015 Jun 1;64(5):1–20.